So, what’s the difference between a heron and an egret? Actually, there isn’t any real difference. All of the herons and egrets found on the Guadalupe River belong to the Family Ardeidae – wading birds with long necks, long legs and long sharp bills that hunt near water. Herons and Egrets are expert hunters, and they spend most of their time searching for fish, rodents, reptiles or amphibians. These birds typically search for food in and near streams, but will also hunt in open grassy fields. 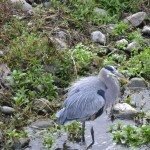 The Guadalupe River provides miles of protected habitat for this fascinating family of birds. Park visitors frequently see at least one of the six species of Herons and Egrets that can be found along the length of the river. What kinds of Herons and Egrets are there? Due to their size, the most common and easily spotted members of the Ardeidae family are the Great Blue Heron and the Great Egret. The Great Blue Heron is the largest member of the family and stands at over forty inches in height with a six foot wing span. This graceful bird is easily identified by its slate blue body and black and white striped head. The Great Egret is slightly smaller than the Great Blue Heron and stands at thirty-nine inches tall with a five foot wing span. 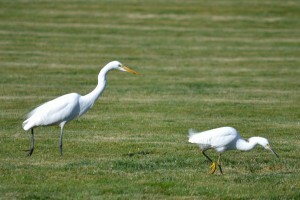 The Great Egret is all white with a heavy yellow bill and black legs. In the spring, the Great Egret put on a dramatic display of light elegant plumes that trail down their back. Although beautiful, the plumes almost caused the loss of this majestic bird in the early 20th Century. During that time, the plumes were at the height of fashion and hunters nearly wiped out the species. Later, Changes in laws that prevented the harvest of Egrets allowed the population to recover. Another bird that can be found along the trail is the Snowy Egret. As the mid-sized member of the family, the Snowy Egret stands at about two feet tall with a three foot wing span. These birds are all white with a slender black bill, have striking yellow eyes and black legs with yellow feet. During the breeding season, the Snowy Egret displays upward curving plumes on their head and neck. Like the Great Egret, the Snowy Egret was extensively hunted, but is now fully protected with healthy, expanding populations. The Black-crowned Night Heron and the Green-backed Heron are also found along the Guadalupe River, but are much more difficult to see due to their small size and shy demeanor. The Night Heron stands about two feet tall and has a short neck and legs with a stocky body. 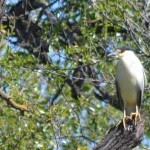 The Night Heron also has a black crown with a long white plume and a black back with a white underside and gray wings. They are most active in the evenings; these birds hunt at night and roost in trees during the day. 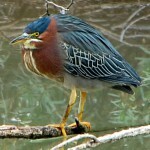 The Green-backed Heron is one of the smallest members of the Ardeidae family found on the river. A short, chunky bird, this species stands about eighteen inches tall with a two foot wing span. The sides of this colorful heron are a striking, deep chestnut red, its back is green, and its wings are blue-gray. The center of the throat and neck are white and the legs are usually yellow. However, the males will develop a bright orange color to their legs during breeding season. Perhaps the most difficult member of the heron family to see is the American Bittern. About two feet tall with a three to four foot wingspan, this short chunky bird is a deep brown color and has black neck streaks as well as a streaked pattern to the breast. They also have dark flight feathers that show up easily when in flight. The Bittern can be found in tall grasses and reeds, and when frightened, it will frequently freeze with its bill pointed up. 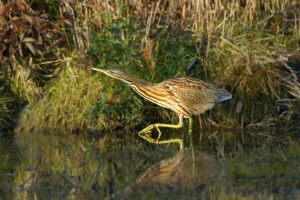 The Bittern uses this upright posture, its markings, and its coloration to blend in with the grasses and reeds. Interested in seeing one of these majestic birds in person? Walk the Guadalupe River Park Trail, and you may just spot one! The Guadalupe River Park Conservancy asks that you watch wildlife from a distance and that you do not approach or feed any animals you find in the park.